Indian Airforce has formally launched The Stores, Proactive, Efficient and Expeditious Despatch of Extra Size/ Wt Consignment (SPEEDEX) contract. It was concluded in June 2018 between with Balmer Lawrie & Co Ltd and Ashok Travel and Tours for air and surface component respectively. The contract aims to overcome delay in piecemeal dispatch of consignment and to move operationally urgent stores by air and normal consignments by surface. Indian Air Force (IAF) launched Trans-Himalayan Mountain Terrain Biking Expedition (THE MTB) as part of its celebration of 86th Anniversary on 8 October 2018 with an aim to promote spirit of adventure among Air Warriors to undertake daunting challenges and ‘Go Green’ initiative. The expedition was started on 17 Aug 2018 from Daulat Beg Oldie (DBO) in Ladakh for Kibithu in Arunachal Pradesh. DBO and Kibithu are two forward most outposts of India in North and in East with DBO being highest airfield in the world located altitude of 16614 feet. This is for first time IAF has undertaken mountain terrain biking expedition of such magnitude. Former President Pranab Mukherjee launched National Electoral Transformation (NETA) mobile application that allows voters to rate and review their political representatives. The app is brainchild of 27-year-old entrepreneur Pratham Mittal. It is first of its kind platform in India that allows voters to rate and review the political representatives in their constituencies. The app aims to foster political accountability and transparency among leaders. It is inspired by US’ approval system. India’s first captive-born Humboldt Penguin named Freedom Baby died barely a week after it was born at Veermata Jijabai Bhosale Udyan and Zoo (Byculla zoo). It died due to new born anomalies like liver dysfunction and yolk sac retention. It was named Freedom Baby as it was born on Independence Day. It was born 40 days incubation period after Flipper, oldest female in zoo’s penguin colony hatched single egg it had laid. The Shanghai Cooperation Organization (SCO) Peace Mission 2018 was held in Chebarkul, Russia. Military contingents of the all eight SCO member nations-China, Russia, Kyrgyzstan, Tajikistan, Kazakhstan, India and Pakistan-participated in this exercise. The exercise was aimed at enhancing cooperation between member states to deal with growing threat of terrorism and extremism. It was for first time since independence, India and Pakistan simultaneously took part in military exercise, though armies of both the countries had earlier worked together in United Nations (UN) peacekeeping mission. Indian Institute of Technology-Hyderabad (IIT-H) has launched “Fabless Chip Design Incubator (FabCI)”, an exclusive incubator to boost chip design. It is first of its kind in India that will focus on creating an ecosystem for start-ups in chip design. FabCI’s purpose is to incubate at least 50 ‘Make-in-India’ chip design companies that can compete globally and generate Intellectual Property Rights (IPRs). India and Singapore have signed Second Protocol amending Comprehensive Economic Cooperation Agreement (CECA) in New Delhi. Its provisions will come into effect on 14 September, 2018. It will help to boost bilateral trade between India and Singapore and formally brings to closure negotiations on second review of CECA. CECA was signed in June, 2005 and its first review was concluded in October, 2007. Singapore is second largest trading partner of India within ASEAN and India is largest trading partner of Singapore in South Asia. The Indian tennis duo of Rohan Bopanna and Divij Sharan clinched the gold medal for India of Asian Games 2018, after they beat Kazakhstan’s Denis Yevseyev and Aleksandr Bublik 6-3, 6-4 in the men’s doubles tennis event. India’s Sawarn Singh, Dattu Bhokanal, Om Prakash and Sukhmeet Singh won India’s gold medal by finishing at the top in quadruple sculls event. Indian rower Dushyant clocked 7:18.76 to win bronze in men’s lightweight single sculls, while the duo of Rohit Kumar and Bhagwan Singh clocked 7:04.61 to win bronze in men’s lightweight double sculls. Shooter Heena Sidhu missed out on the gold and had to settle for bronze in the women’s 10m Air Pistol event. In men’s singles tennis, India’s Prajesh Gunneswaran also settled for bronze after losing to Uzbekistan’s Denis Istomin 2-6, 2-6. 15-year-old Shardul Vihan, won India’s silver medal in the finals of the men’s double trap event. 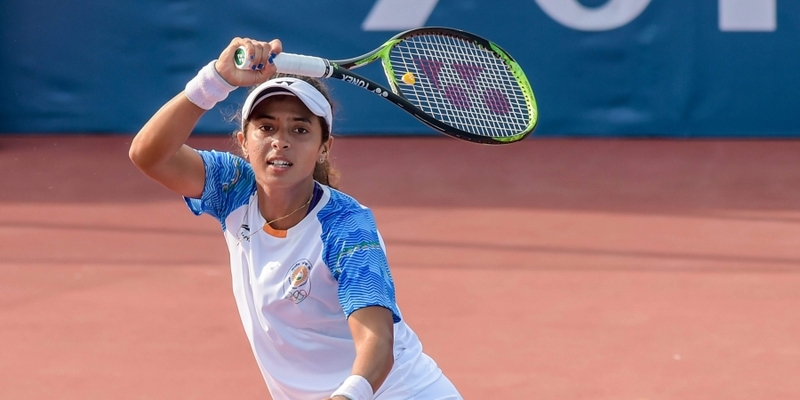 Indian tennis player Ankita Raina won bronze for India. She is the second Indian woman after Sania Mirza to win a medal in the tennis singles event at the Asian Games. Indian men’s kabaddi team settled for bronze after 18-27 loss against Iran. Indian women’s kabaddi team settled for silver after being defeated by Iran 27-24. India’s medal tally now includes 25 medals – 6 gold, 5 silver, 14 bronze. 1. Who launched the NETA App? 2. In which military exercise India and Pakistan simultaneously took part? 3. How many member countries are there in Shanghai Cooperation Organization (SCO)? 4. Who launched Fabless Chip Design Incubator (FabCI) first time in India? 5. When was CECA signed? 7. Which among the following pair has won gold in tennis doubles in Asian Games 2018? 8. Who is the first Indian woman to win a medal in tennis singles at Asian Games?